Cervical cancer is the most common cancer in Indian females and is associated with infection with high risk Human papillomaviruses (HPVs). Curcumin (Diferuloyl methane), a chemopreventive agent, is a natural compound extracted from Curcuma longa that allows suppression of carcinogenesis. The objective of this study was to identify the molecular mechanism of curcumin induced apoptosis in HPV positive cervical cancer HeLa, SiHa and Ca Ski cells. 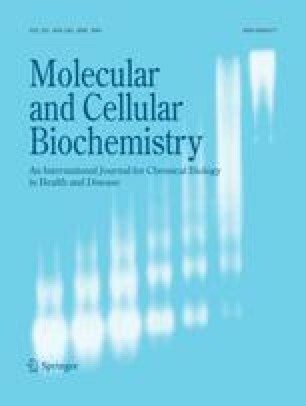 Curcumin causes distinct inhibition of human telomerase reverse transcriptase (hTERT) the catalytic core of telomerase thereby reducing proliferation of cancer cells. Curcumin mediated apoptosis in these cells appears to be due to upregulation of proapoptotic Bax, AIF, release of cytochrome c and down regulation of antiapoptotic Bcl-2, Bcl-XL in HeLa and SiHa. This was accompanied by an increase in caspase-3 and -9 activity, suggesting the role of mitochondria in curcumin mediated apoptotic cell death. Curcumin acts as an anti-inflammatory and anti-proliferative agent by causing down regulation of COX-2, iNOS and cyclin D1 in all the three cell lines but to different extent. This work was supported by a senior research fellowship from CSIR to Mayank Singh and partially by grant from DBT.